For several weeks now I’ve been working with Caroline Dunn on the detailed layout of the kitchen. Justin and his team had specified an outline design which covered the basics but I wanted to take advice from a kitchen specialist who could help me review some alternative options before finalising the layout of the units and the appliances. While there’s definitely no need to choose the colour scheme and finishes at this time, things like the placement of the hob and its extractor affect the location of the MVHR intake above those and the position of the island unit affects the routing of the under-floor waste pipe for the sink. It would be a shame to find that either of those needed to be moved later. Caroline is an independent kitchen designer based in Cheltenham. While you can find kitchen designers at any kitchen showroom and most big DIY stores some of them are far from being specialist designers and I wanted someone who would offer impartial advice on budget, the best height for the worktops etc. without just trying to sell me something from their limited range. After a couple of iterations Caroline has come up with a design that we’re both happy with. It’s pretty simple and minimalist in layout, which is what I wanted, and incorporates a fairly small and efficient “work triangle” while also providing plenty of storage and some seating. 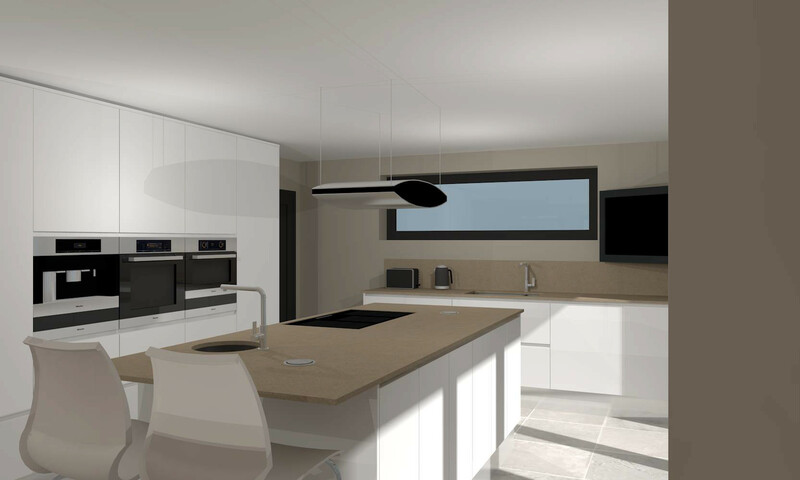 In addition to preparing detailed drawings and specifications for the units and the appliances Caroline prepared some photo-realistic 3D renderings of how the kitchen might look. While I’m perfectly aware of how good these can be I was surprised how realistic they look – one sample below. The new Planning Application was submitted to South Derbyshire District Council on 24 June. The SDDC reference number is only confirmed when the application fee is received, and even for applications submitted online, via the Planning Portal, this must be paid by posting them a cheque. Update 2013-07-03: The SDDC reference number is now confirmed as 9/2013/0492 and the application is now visible on the SDDC Planning Website. The consultation period ends on 2013-07-24. The documents submitted to support the Planning Application are also available on this page.